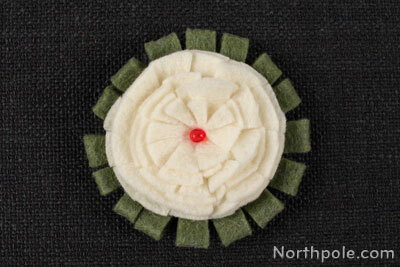 The squarish petals of these felt flowers give them a stylish character. 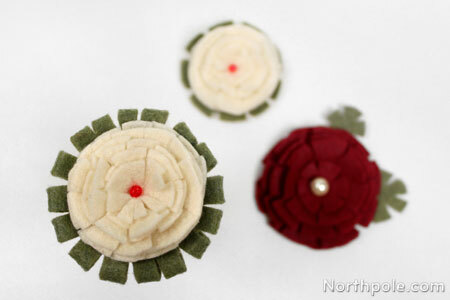 These boxy blossoms are made using a minimal amount of hot glue, which makes them lighter than some other felt flowers. 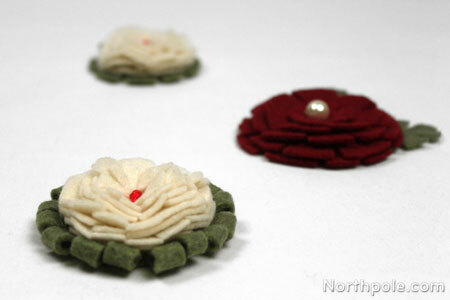 Since these are lightweight, they are great for brooches or hair clips. Keep reading to find out what technique we used to make these blooms. Cut out four 2" circles, two 1.5" circles, and one 1" circle from off-white felt. 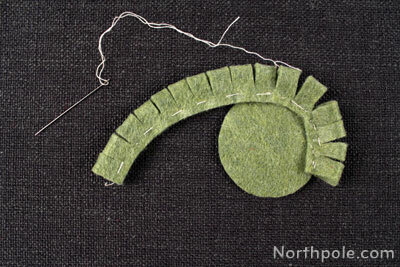 Cut one 2.5" circle from green felt. You can freehand the circles, or use the template, if you like. 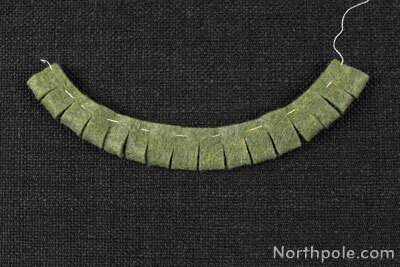 Cut notches along the edge of each circle (no longer than 0.5"). Set aside. 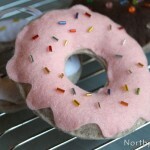 Note: Stack like-sized circles together, and then cut notches for quicker cutting. 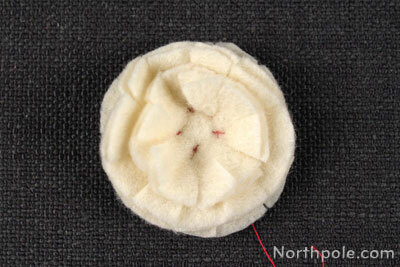 Stack the 2" circles together, and sew stitches in the center with needle and thread. 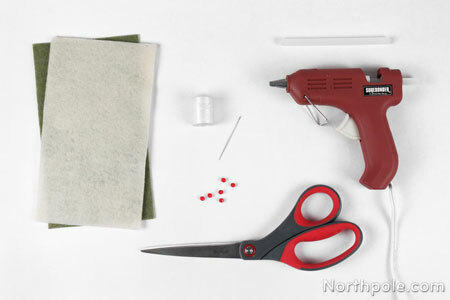 Pull thread to the back of the stack and pull tight on the thread until it pinches the layers of felt. 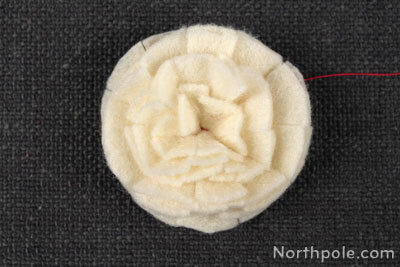 Add two 1.5" circles on top of the stack and sew in place, tying the thread tightly on the back of the flower. 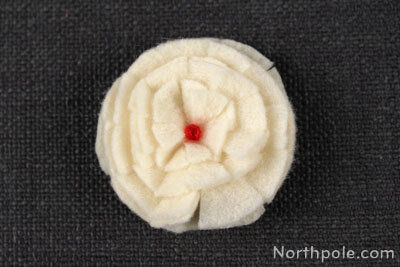 Add the 1" circle and sew in place. Tightly tie the thread. Finally, add 1 or 3 beads in the center. Tie off thread. 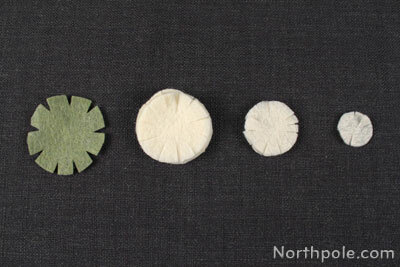 Glue the green circle onto the back of the flower to hide the construction. Now your flower is finished! 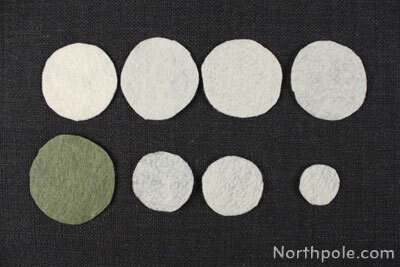 Cut a 2" circle and a rectangle measuring 6" x 1.5" from green felt. 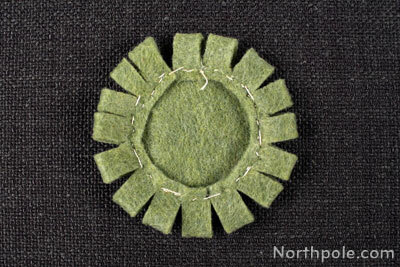 Fold in half lengthwise and sew a running stitch along the long edge. Cut incisions on the fold line that are 0.5" long. 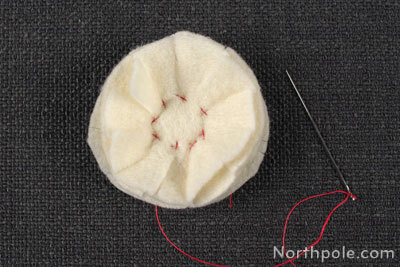 Begin sewing the long piece around the circle, loops facing out. As you finish sewing, tie off the ends. Glue to the back of the flower. 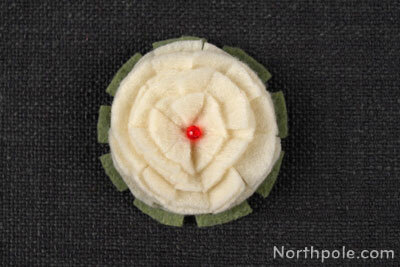 Now your flower is complete! 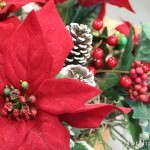 Add to you�re your favorite project or Christmas decoration.